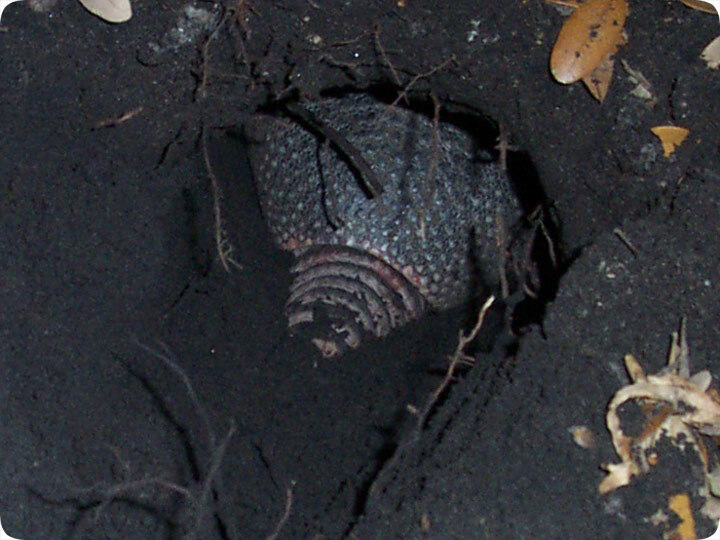 03.04.2004 - This is a photo of a Nine-Banded Armadillo digging a fresh burrow. I came across this animal while on an armadillo trapping project. Dillos usually dig several burrows within their home range. I'm not sure how many, but the number may be from 10-20. They usually have a primary burrow or two in which they sleep - and armadillos sleep about 20 hours per day. These big burrows are straight and deep, and may have a chamber at the end. However, most of the burrows that armadillos dig are merely short-term escape tunnels, in case they need to bolt from danger. In fact, sometimes armadillos will start digging as a defense mechanism - they can't necessarily run away quickly for a long time, so they'll expose their tough behind and dig their way to safety. That's what the armadillo in the above photo was doing - it was trying to escape me. It didn't of course, but it made a good show of it. Armadillos are very strong, and they can dig quickly with their sharp claws. They can also hold on tight, so you can't really just grab them by the tail and pull them out. If you want to get an armadillo out of its burrow, you've got to dig it out! As for how to stop armadillos from digging in the first place, you really can't. If they want to dig, they'll dig. The only thing that will stop them is a physical barrier. So for example, if they have an established digging area, I can install a steel mesh a few inches under the ground, so that when they start to dig, they'll hit the mesh and are unable to go any further. But there's no chemical or natural armadillo deterrent or repellent that will keep them from digging. Armadillo Digging In The Yard - This is one of the key signs that many people will identify when they find that they have an armadillo problem, and this can be hugely frustrating for many people, particularly those who are proud of their garden. In some instances the armadillo will seem to focus on a particular lawn area or a vegetable patch, but this will generally depend on the number of insects that are to be found in that particular part of the garden. In other cases armadillos may be attracted to the yard because of the accessibility to garbage, and may start digging in the yard afterwards. The best solution to stop the armadillos from digging in your yard is to actually remove the armadillos from the yard. It is worth checking your garden to see if there are any burrows to be found in your garden, and if there are no visible burrows then it is a problem that can usually be solved by a suitable fence. The best exclusion fences are those that have a wire mesh with a narrow space between each wire to prevent animals from squeezing through, and it is best to ensure there is some of the wire mesh embedded into the ground so that the armadillos can?t dig their way in.